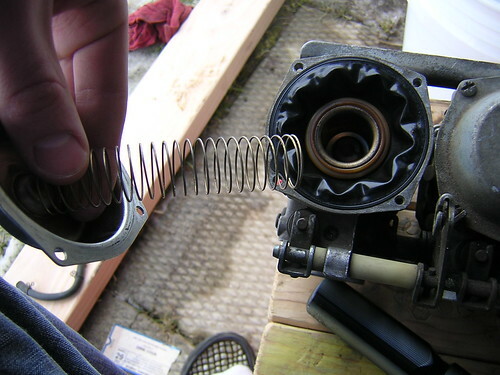 Home Come Back Any Time 2008 September How to Clean a Motorcycle Carburetor, the RIGHT way. How to Clean a Motorcycle Carburetor, the RIGHT way. 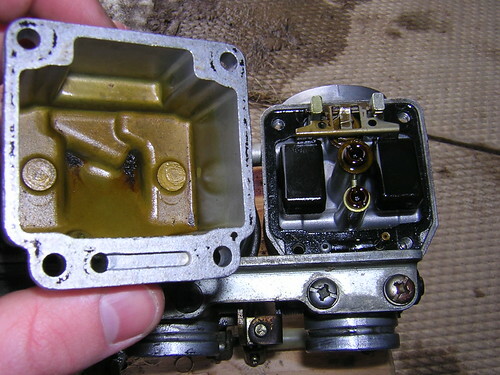 I get asked about Carburetor Cleaning regularly both from readers and from friends offline. So I’ve decided to write a definitive guide for cleaning carbs the RIGHT way. So put your tools down for a minute, grab a beer, and give this a read. You might just save yourself a lot of headache and sweat. Carbs come in many shapes and sizes. Single carbs, dual carbs, racks of 3, 4 or 6, V racks, carbs with ticklers, carbs with accelerators, carbs with asynchronous designs, and carbs that operate vertically. 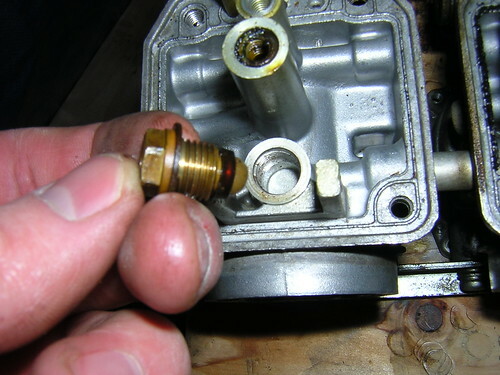 While working on some carburetors is more difficult (due to design) than others, they all share the same basic components, and the process of cleaning those components is generally indentical. Make sure that dirty carbs are actually your problem. Lots of things can make a bike run poorly or not start. Weak battery, corroded electrics, old spark plugs, bad timing, low compression, mis-adjusted valves, dirty air filter, and plugged exhausts can all cause poor running. I’ll write an article on how to diagnose poor running conditions shortly, but for now – lets just deal with the carbs. First remove the fuel tank, seat, and side covers. Depending on your model of bike other parts may need to be removed too. 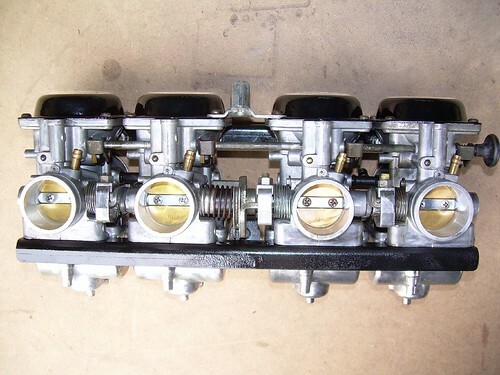 Â For many single cylinder bikes the carb can often be removed without removing any body work at all. Now your carbs should be pretty well emptied out. 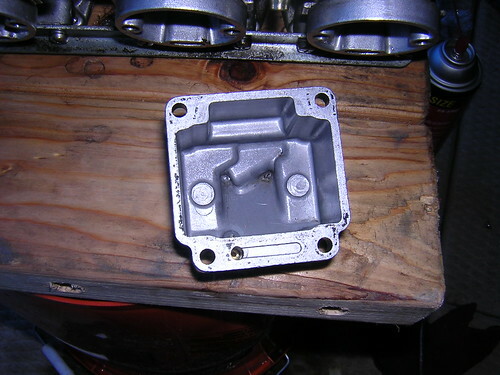 If the throttle on the bike moved fluidly and smooth there is little reason to do much to the carb bodies themselves. 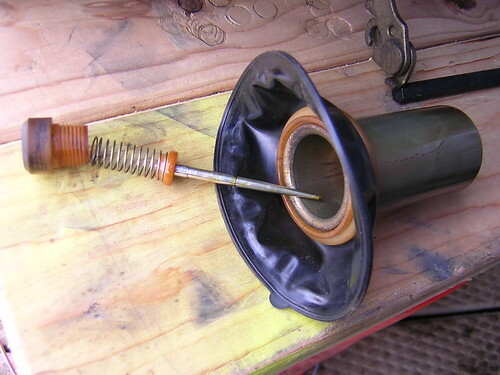 However, if the throttle was real sticky or frozen there are a few things you can do to free it up. Sometimes just drenching all the throttle components on the carbs and letting it soak is enough, other times it is not. I generally try not to break racks of carbs apart. It isn’t often necessary and can be confusing to put everything back together in the right places. 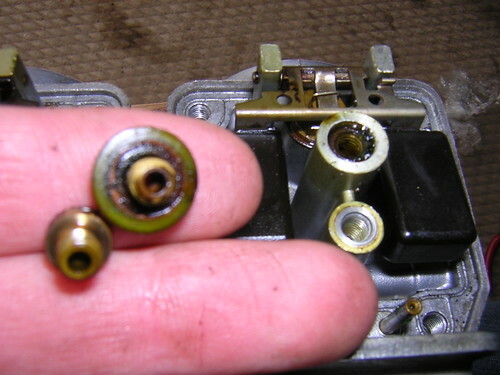 Also, the little rubber connector hoses and o-rings have a tendency to crack or leak if you mess with them. If you can’t work the throttle back and forth until its smooth have a look at the boiling tips further down. Compressed air. – Force 100 pounds into it. Works occassionally. Make sure to hold the jet tightly so it doesn’t go flying across the garage. You might put the jet back into the carb body to hold it in place for this. This is pretty straight forward. Use any of the methods above to tranform your varnished bowls. Hello, I have a Yamaha silverdao 1700cc, 2007. The bike has been sitting in the garage for the last nine months without starting, do you think the carb. Should be cleaned? Any thing else should be done before that? I appreciate sharing your experience. By the way the bike doesn’t start right now. Fantastic article,struggled for a long time to get info like this. I live in south Africa and not many guys here helps like you did. FYI-I have a 1985 750 pre-sling. Your article gave me the confidence to do this. I had been putting this carb clean off for 8 months just hoping my bike would start and run properly. About 3 or 4 hours later and the job is done and my bike runs. Thanks so much for the time you put into this article. You’ve turned my useless, space-wasting, rusty old bike back into the machine I fell in love with. 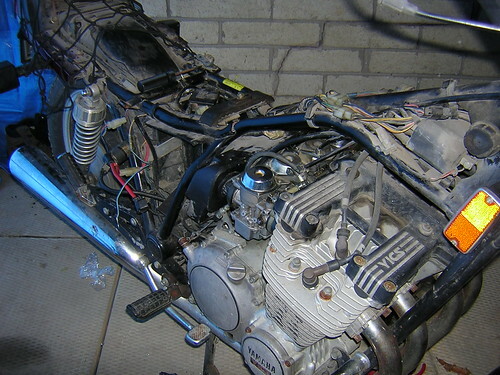 I just bought a 82 suzuki gs650g that needs the carbs cleaned but i have not done it yet but i will be doing it very soon but without your help i would not have known where to start so Thank-You so much & i will be doing the carbs soon. P.S. What kind of lemon juice do you use?? 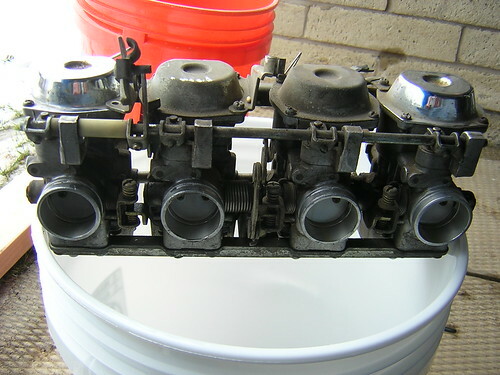 I have an 1988 yamaha radian 600 with almost the same set of carbs as that. Im going to try boiling them in lemon juice to clean it, but I cant seem to find a rebuild kit for them. Would you know any good sites to find one? Man super cool write up, I have a 1992 Vmax that runs like you no what, popping through the crabs and some back firing. 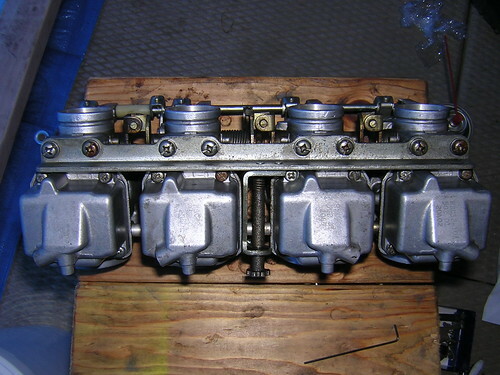 To have the carbs clean cost almost $450.00 to $550.00 at a local shop. I going to try this my self. But 1 carb at a time. Thanks for right this. I did try sea foam 3 time it did not work for me. Thank you for the lemon juice trick! They came out awesome! Thanks for this article. 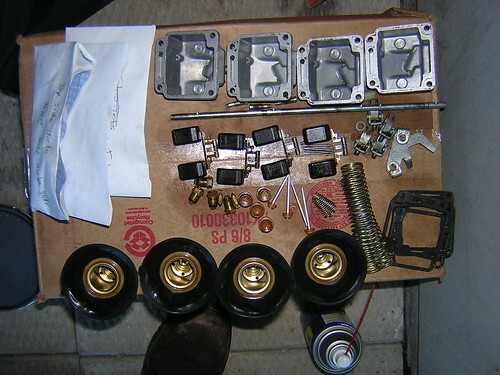 I am about to tackle the carbs on a 96 Magna that has been sitting poorly prepped for several years. The lemon idea is eco-inspiring. Now, if you have any thoughts on cleaning a rusty tank, my day will be perfect! Sounds like your primary jets are plugged. This is easy to fix. I would clean the carbs paying close attention to the jets. Don’t touch any of the settings just flip them over and pull out the jets and clean them. Inspect the carb for any loose debris in the bowl. You will have to pull the carbs . Flip them over and pull the bowls off. Even a little dirt can plug jets. Take off the float and take out the needle seat. You will find a variety of jets and things . UnScrew them and put them neatly on your work surface. I usually have a blue shop towel to lay them on as they won’t roll away. Take a look through them. they should be clean inside. If they look dirty follow Evans advice and carefully slide a wire through them. Put every thing back together. It is easy. You can’t mix them up as they only go in one way. If you are worried take pics before you strip things down. Don’t take anything off except from inside the bowl. Awesome I had the same problem with the idle after I replaced the carb joint conn yesterday. Now I feel a lot more confident about my cleaning project. Thankyou! 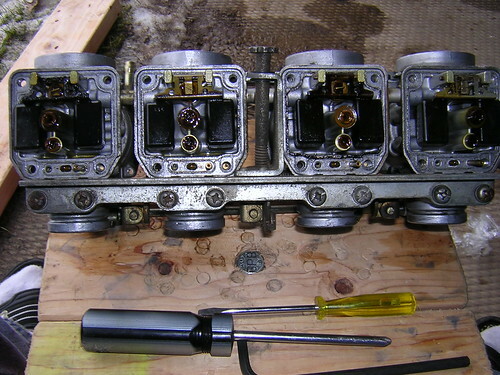 great article … I’m preparing to clean the carbs on a 1994 zx7. I can wait to try the lemon juice !! Great article! Makes me anxious to get my fuel tank off and start working on it. I have a 1997 gsxf 750 katana and for some reason the idle just varies a lot. i mean it will go between 1200 to 2000 . Do you believe its clogged carbs or just a vacuum leak? Thanks a bunch ! Awesome how to! Much appreciated. The only thing I can’t get off is the needle seats, which I thought would be the easiest. Any tips? I’ve sprayed them with WD40 and am using a 10mm socket (b/c that seems to grip better than a 10mm wrench). But no joy on any of them. Evan, what a great article. Wish I had seen you blog before I did my carbs on a Kawasaki Zephyr 1100. I own a 1982 Yamaha XJ650 with that worthless YICS system. I probably purchased 7 cans of carb cleaner and still the piece of junk won’t start. I purchased 4 float needles and seats and took 5 hours to clean and install the float needles and seats. 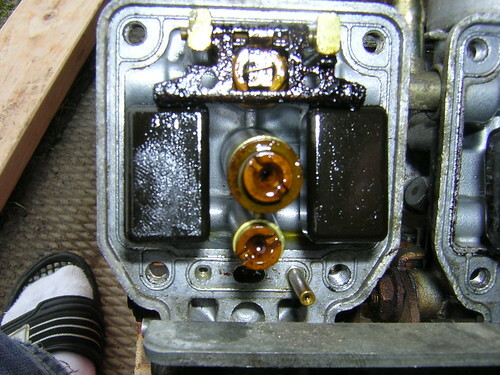 End result number 2 carb has gas pouring out the back of the carb where the main needle is. I have NEVER seen such a piece of junk in my life as the XJ650 is. I had other Yamaha’s like the Exciter and 650 special. I had to bang the starter on Exciter to get it going. That’s it. I tore mine open and got all the Pilot jets out except for one, I dont know if you run into this a lot or not, but I dont want to reef on it and damage it more than i already have. I was just looking for tips. or maybe ways to clean it as much as possible without actually removing it. The bike I’m working on is a 1975 Honda 400 Super Sport when it runs it is quiet. Great article! Good information that I will need to tackle my own carbs, thanks! something unbelievable to be around. Many boats are auctioned because they were repossessed and may be in excellent to fair condition. Great article! Will be using this on my 1996 yamaha fzr600. Thanks! 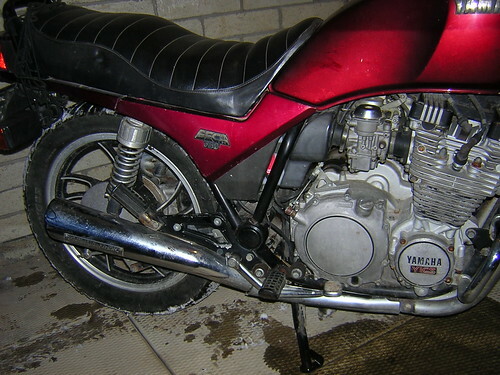 Is there anybody who could draw up a diagram of the fuel lines and vacuum lines , for my 85 Yamaha xj700? Thx Evan. Great article well written. A great read and a big help to most however on my carb off of a Suzuki gs 1200 bandit it has seized up on the throttle control mechanism. 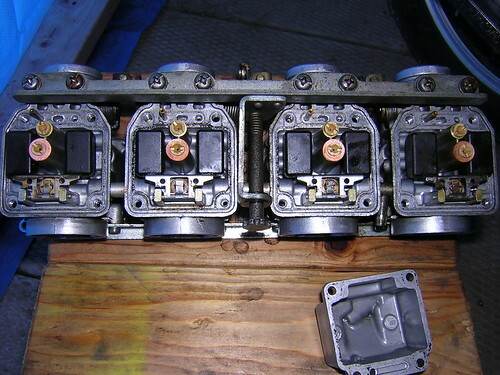 where the throttle cable attaches to the carb? any advise to un seizing that will be a great help thanks. I’m not sure lemon juice removes varnish or grease from carbs but it did clear the jets on my 94 Honda F2. I’ve had clogged jetting problems for 12 years with my Honda F2. Thanks! you saved me hundreds of dollars. The bike was almost unrideable before the carb clean but it’s fine now. mail / May 13, 2009I used aztech DSL600E before and find my internet connection too slow. After I replaced with new D link DSL520T only I find that my ISP is actually sucykRepl.